Originally released on vinyl R&S in 1994, ‘Meditation Will Manifest’ was re-earthed in 2016 by Nina Kraviz and Ricardo Villalobos, becoming a secret weapon on dancefloors 22 years after its original release. 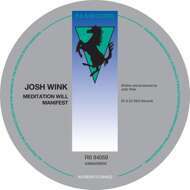 Josh Wink has always been ahead of musical trends and walks his own path in dance music. From a young age Wink was exposed to different mysticism and consciousness philosophies. “It wasn’t a big, popular or trendy thing to do at the time, but I was 14 and just did what my mother did… Releasing tracks like ‘Meditation Will Manifest’ and ‘Higher States of Consciousness’, people looked at me as being this deeply profound spiritual guy, but I never really thought about it in that way, even though I’m really into repetitive, transcendental and meditative rhythms. I don’t do drugs, so I never really had another outlet to get into alternative states.” – Josh Wink (taken from recent Mixmag article).